These pages offer an introduction to the research process at a very general level. Research is a life skill. You use it every day inside the classroom and out. Which smart phone should I buy? What college should I choose? Should I have this surgery? You apply the same modes of research in your coursework for papers, presentations, discussion posts, and more. 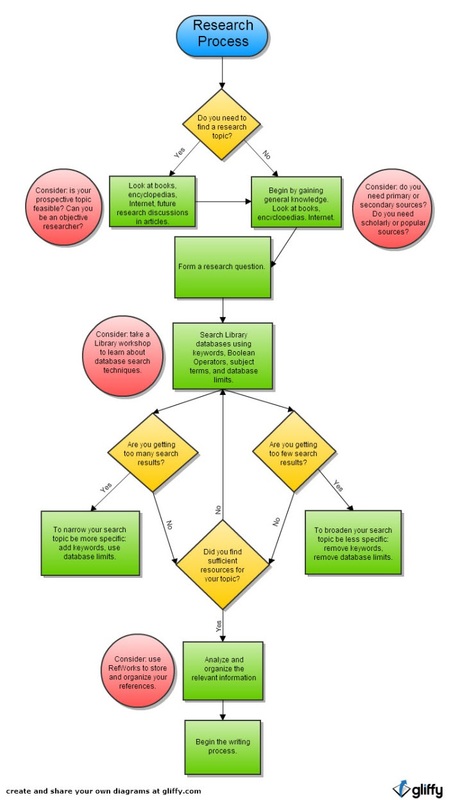 It is crucial to know how to navigate through this linear research process. In doing so, you will gain lifelong skills of information literacy. The details for each step of the research process will vary depending on the topic, available research, and assignment or research goal, but the main idea behind each step will always remain the same. By developing a research strategy, you will be better able to focus on your topic, organize your search, manage your time efficiently, progress from general to specific resources, and understand when you have researched your topic thoroughly or if further examination is needed. Remember that the research process takes time and effort. You should not expect to complete all of these steps in only a few hours; in fact, library research for a dissertation often takes years. By thoughtfully approaching your assignment you will be able to pick a reasonable topic, research the topic, and compose an organized piece of scholarly research.